Use keywords to filter the FAQ answers. Does Ezy Homes have display homes? No. We have supplied hundreds of steel frame kit homes to many areas of Australia and may have one close to your area, that you could possibly inspect. Just phone for more information regarding the nearest Ezy Homes to you, or have a look at our Google map of previous projects. Can I make changes to your designs, or design my own home? Yes. You have nearly 100% flexibility when designing your home. Ezy Homes use a post and beam design – which allows for a very open plan – and gives us the ability to adapt your ideas into our cost effective structure. Changes can be made to our designs easily and economically. Can I supply like my own PC items, and have the builder install them? Yes, this is quite common. You are able to hunt for bargains or choose something special, and have it included in your builders contract for your new home. How long does it take to manufacture the steel frame and have it delivered to site? Each component is custom manufactured to your requirements, so it takes about 4 weeks to fabricate your steel frame materials and deliver to site. 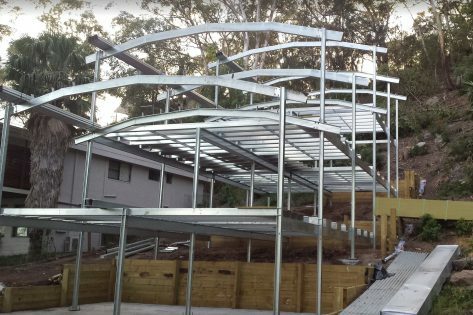 How long does it take to build a steel frame kit home? Once the frame kit is delivered (4 weeks after your site preparation), the frame, floor and roof are completed in only 5 days. It then takes about 3 weeks to reach the lock-up stage. The balance of the house depends on how organised you are, and how much work you plan on doing yourself. Allow a total of 12-16 weeks for the entire project, or up to 20 weeks where seasonal weather may cause delay’s. Can the average handy man build a steel frame kit home? Yes. The Ezy Homes concept was designed for the handy man(person), with minimal tools, in a remote area or difficult location. You will still need to use a licensed electrician and plumber – all other work can be completed by a handy person. Simply utilise local tradesmen for any tasks that you feel are beyond your skill level (eg plastering). 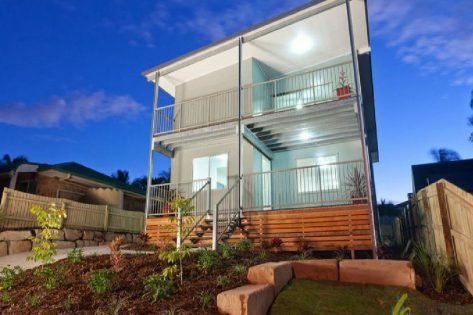 Can Ezy Homes build the home for me? Although Ezy Homes no longer constructs the homes, we have a network of builders who are able to construct your home to a stage that suits you. Instead of managing our own construction staff, Ezy Homes focus on assisting our clients to liaise with our database of proven builders and tradesmen – as well as helping clients to source their own local licensed builders. You can utilise your local tradesmen or select from our list of Builder Partners to complete some, or all of the construction work for you. 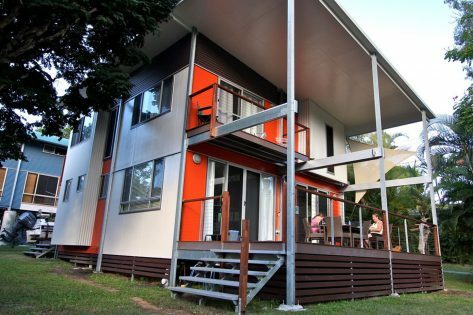 Can Ezy Homes be sent overseas, like to PNG or the Pacific Islands? Yes. Many Ezy Homes have been exported to PNG – so we are experienced in supplying our homes overseas. An entire full materials kit can be packed within a 40′ container. Packing & shipping costs an average of $6k to PNG, including container hire. Optionally we are able to purchase a shipping container that you can keep, rather than return. Does Ezy Homes offer any after sales support? Yes. We offer 24/7 construction support, for owner/builders as well as for tradesmen and licensed builders. How much money will I save by being an owner/builder? Owner/builders save approximately 20% – depending on how much work you do yourself – and depending on how hard you hunt for those bargains. For some, owner/builder provides the opportunity to build a very high quality home for a similar cost to having a basic “cookie cutter” home built for you. 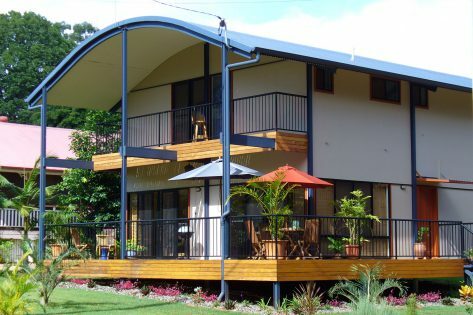 Are Ezy Home suitable for Cyclonic area, like the tropics? Yes – one of the main benefits of our construction system is its strength. We can engineer the frame to suit any wind rating, eg C1, C2, etc. There are many Ezy Homes located in Cyclonic areas (North Qld & PNG) that have stood the test of time through cat. 5 cyclones & even the odd earthquake. What is the Bushfire rating for Ezy Homes? The steel frame itself is fully fire resistant. When drafting your plans we ensure that all associated building materials comply with the BAL (bushfire attack level) rating for your property. 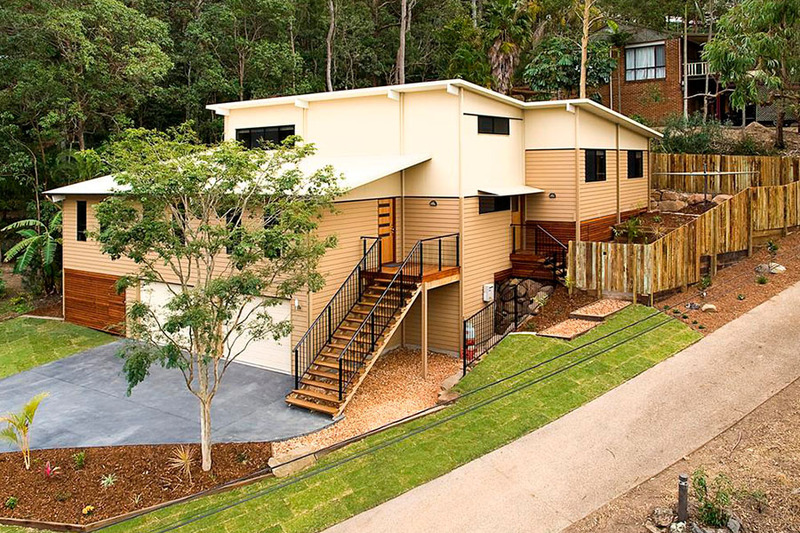 We have designed & supplied many homes to areas with bushfire overlays, and are very experienced in the building code requriements. What are the other benefits of being an owner/builder? Control of project – don’t be limited by your builder. Flexibility – last minute changes aren’t a problem when you are in control. Use your preferred tradesmen – perhaps you have family/friends in trades. No waiting time – work to your timeline, not a building companies. The final result is the home YOU want, how YOU want it. What are the benefits of using steel to construct our homes? What guarantees come with the kit home materials? What guarantees come with a builder contract? Each state has their own rule to protect consumers from unexpected events. For example, in Queensland, QBCC insurance is compulsory. Can you recommend a contractor or product for my area/project? Yes, sometimes we recommend products or services. We provide these recommendations because we want you to be able to benefit from our experience. These recommendations are provided as a free service to both you and the product/service provider and are based on our knowledge, experience, testimonials and past performance at the time. Note:- We have no control over how the product or service will perform in the future on your project. We recommend you do your own research to make sure that the product/service is the right fit for you prior to engaging.